Rep. Birmingham successful pushed for House passage of his bill to put gas and electric power holding companies under state supervision. The bill was passed May 1 by a vote of 118 to 72, the Boston Herald reported (May 2, 1934, p. 11, via Genealogy Bank). The bill would put the state Department of Public Utilities in charge of corporations, partnerships, trusts, and voluntary associations owning or controlling more than 5 percent of the capital stock of a gas or electric power company. Opposition to the bill’s passage was led by Rep. Harry D. Brown of Billerica, the Republican floor leader. But Birmingham prevailed in the fight for passage. Upon House passage, the bill was sent to the Senate for approval. Al Smith arrives at 1932 DNC. Many Massachusetts Democrats, including Gov. Ely and Rep. Birmingham, reacted favorable to Al Smith's announcement in February 1932 that he would be willing to be the Democratic presidential candidate, if the Democratic national convention supported his candidacy, the Boston Herald reported (Feb. 8, 1932, p. 1, 4, via Genealogy Bank). At the same time, Smith stressed that he would not actively campaign for support, so his name would not appear on the state primary ballots. Mayor James Michael Curley, who supported Franklin Delano Roosevelt, declined to comment on the Smith announcement from his vacation spot in Cuba. John Warner supporters at the 1932 Democratic National Convention. Boston Mayor Michael J. Curley, a Franklin Delano Roosevelt supporter, was able to outflank Rep. Birmingham and Chelsea Mayor Lawrence F. Quigley, both supporting Al Smith, at the 1932 Democratic National Convention in Chicago, the Boston Herald reported (July 3, 1932, p. 4, via Genealogy Bank). Because of his active support of FDR, Curley was not part of the Massachusetts delegation to the convention, which was pledged to support Smith. However, FDR supporters were able to maneuver so that Curley was at the convention as a delegate from Puerto Rico. Both Birmingham and Quigley had challenged Curley’s right to speak at the convention. However, they were caught off guard when Curley took the stage at the convention and joined in the seconding of John Garner as the running mate to FDR. Sensing the support for Garner at the convention, the Massachusetts delegation withdrew their opposition and sat silently as Garner’s nomination for vice president was approved by voice vote. Rep. John W. McCormack of South Boston declared that he would second Garner’s nomination on behalf of Massachusetts, but opposition from his fellow delegates changed his mind. In response to Garner’s nomination, the Massachusetts delegation deserted their section of the convention hall. A large group of delegates decided to leave Chicago early and arranged for a special train to take them back to Boston, the newspaper reported. Gov. Ely, a Smith supporter, delayed the special train’s departure in order to keep the delegation at the convention for the final session, although some delegates left early anyway. Rep. Birmingham faced opposition from his own party Feb. 20 in his attempt to stop three bills related to working hours and workmen’s compensation from passing the House, reported the Boston Herald (Feb. 21, 1931, p. 24, via Genealogy Bank). One bill would make workmen’s compensation retroactive to the date of injury. The two other bills would provide watchmen and employees who maintain fires with a mandatory one-day off in seven days worked, respectively. Birmingham worked with Speaker of the House Saltonstall in defeating the bills. In fact, Saltonstall ordered the doors of the House locked, and the members were placed under technical arrest, in order to defeat the bills, the newspaper reported. Many of the Democratic representatives protested against Birmingham’s effort to join forces with the Republican leadership. They complained that they had not been informed in advance of the votes. They assumed that Birmingham was working at the direction of Gov. Ely, who opposed the legislation. A number of independent Republicans joined with the Democrats in trying to get the bills passed. Ultimately, two of the three bills were defeated. The bill that would make workmen’s compensation retroactive was defeated by a vote of 77 to 68. The watchman’s bill was defeated by a vote of 82 to 63, while the bill on employees maintaining fires was given its first reading by a vote of 79 to 77. Rep. Birmingham, along with Rep. Francis E. Rafter of Salem and Rep. John V. Mahoney of Dorchester, led the fight to push Gov. Ely’s luxury tax package through the House after the committee on taxation reported the tax package unfavorably on May 19, the Boston Herald reported (May 20, 1932, p. 1, 20, via Genealogy Bank). The luxury tax package included excises taxes on tobacco, soft drinks, and amusements. Birmingham was charged with leading the fight on the soft drinks tax, while Rafter promoted the tobacco tax, and Mahoney pushed the amusement tax on theaters, baseball, boxing, wrestling, and hockey. Sen. Erland F. Fish of Brookline, chairman of the taxation committee, said his panel could find no justification for singling the three industries for special taxation. He said that no tax increases should be voted on until cities and towns reduce their expenditures. 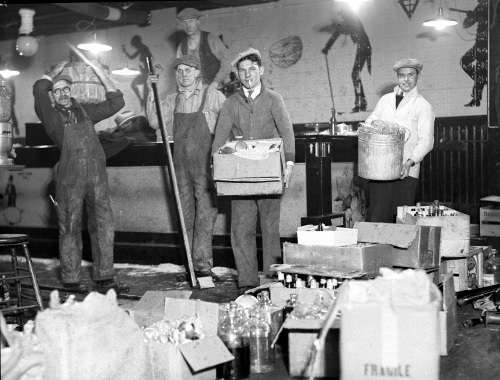 Raid on the speakeasy at 153 Causeway St. 1932. Photo courtesy Boston Public Library, Leslie Jones Collection. Rep. Birmingham attacked a report prepared by Attorney General Warner on corruption charges involving the Boston police department and Oliver Garrett, head of Boston’s vice squad that was tasked with cracking down on bootlegging, the Boston Herald reported (May 25, 1930, p. 14, via Geneaology Bank). Birmingham criticized Warner’s report and his conduct of the investigation into Garrett, who was accused of extortion and racketeering while working on the vice squad. Despite his attacks and those of other representatives, such as Rep. Roland D. Sawyer of Ware, Warner's report was accepted by the House. Among other things, Birmingham said that Warner was complicit in having John F. Sullivan, former owner of the Ritz Hotel, committed to the Danvers Insane Hospital. This was intended to undermine Sullivan’s testimony in a trial, he charged. Birmingham also charged the joint rules committee with being involved in an effort to stop the investigation into Garrett. The committee had denied former Police Commissioner Wilson a public hearing to prevent him from revealing information that would be embarrassing to prominent members of the Republican Party, he said. Sawyer had earlier introduced a resolve to set up a commission of 13 members to resume the investigation into the Garrett case, but the resolve was rejected by the House. Sawyer then introduced another resolve that would create a special commission including the attorney general, one senator, and three representative, which would investigate the entire subject of the enforcement of prohibition by the police throughout the state. Sawyer said that Republicans who favored prohibition, the so-called “drys,” were responsible for blocking the investigation into Garrett. “Three years ago when the complaints against Garrett first were heard, the dry element backed him as an efficient officer. This room rang with the oratory of dry spokesmen who were against any investigation of Garrett,” Sawyer said. Rep. Birmingham came out strongly against a bill that would have required anyone requesting a jury trial to pay a $10 fee. “The man who works for $12 a week on the ERA will be deprived of the right of a jury trial under this bill,” Birmingham said in opposing the measure. Fellow Brighton representative Martin Hays supported the bill. “We have the most cumbersome, obsolete, almost vicious court system of any of our sister states,” Hays said. “The delay is extraordinary. When decisions are handed down, they are almost a travesty of justice because of the delay. In England cases are disposed of in six months. In Massachusetts it takes four years,” Hays noted. “There are so many judges now that they are stumbling over each other. We do not lack judges. The delay is caused by the lack of celerity with which jury trials are secured,” Hays added. He stressed that under the bill a judge would be allowed to waive the fee if a plaintiff or defendant did not have sufficient funds. Despite Hays’ arguments, the House sided with Birmingham, rejecting the bill by a vote of 141 to 67. An amendment offered by Rep. Birmingham to an old age pension bill lowered the age to qualify for pension benefits from 70 years to 65 years for men and 60 years for women. The House approved Birmingham’s amendment by a vote of 117 to 109 and then passed the amended bill by a vote of 202 to 27 on May 12, the Boston Herald reported (May 13, 1930, p. 4, via Genealogy Bank). In pushing for amendment’s adoption, Birmingham argued that a 65-year-old man would be unable to get a job and would have to go to the poor house as a result. He also predicted that if the Republicans failed to pass the measure, they would be voted out of office in the next election and the Democrats would pass an old age pension bill in the next legislative session. The bill as passed by the committees on pensions and ways and means provided old age pension benefits for people of 70 years of age and older. Rep. Henry L. Shattuck of Boston opposed the Birmingham amendment, arguing that people under 70 could get assistance under present law. The cost of lowering the age would cost $3 million, one-third coming from the state. He argued that no other state provides old age pensions to people as young as 65 years of age. Rep. Clarence S. Luitweiler of Newton also came out against the Birmingham amendment. He expressed his opposition to any noncontributory pension. Another amendment, offered by Rep. John Halliwell of New Bedford, deleted a provision from the committees-passed version that would have directed the boards of public welfare to give consideration to the ability of “kindred” to support old age pensions beneficiaries before awarding payments. That amendment was adopted by voice vote. The bill was expected to go to the Senate for concurrent action, the Herald reported. During an April 29 Joint Rules Committee hearing into the International Paper and Power Company, Rep. Birmingham grilled the president, Archibald R. Graustein, about the company’s control of much of the state’s power assets and the Boston Herald-Advertiser newspapers, the Boston Herald reported (April 30, 1929, p 1, 14, via Geneaology Bank). Birmingham asked Graustein if he would be willing to allow the legislature to look at the company’s books and records. Graustein answered in the affirmative. Then Birmingham asked him if he expected to make additional acquisition of power operating companies in the state, to which Graustein responded that he did plan to make additional acquisitions. Birmingham asked Graustein to provide the details of his company’s planned acquisition of the Worcester Electric Light Company. He responded that he had told the committee what he knows and that Frank D. Comerford, president of the company’s subsidiary New England Power Association, could provide additional details. The House minority leader noted that Graustein’s company acquired some of Worcester’s stock at $185 per share. He asked if the company had arranged to pay for all of the stock at that price. Graustein said that his company arranged to acquire some ownership by the exchange of securities, the value of which was not yet determined by the market. Birmingham then asked how many shares of the Herald-Traveler the company had purchased. Graustein said it was 50 percent, but declined to disclose the price per share. The representative asked if the purchase price was in excess of the market value, and Graustein adamantly said that it was not. Birmingham asked Graustein if he believed the public was concerned his company would use the Herald-Traveler to elect governors and senators favorable to its interest. “The Herald and the Traveler have been here for a long time. Their policies are known….And we won’t try to dictate [policies] in the future. It would not be good business. We have a financial investment in the Herald-Traveler. The only way to make money on it is to get circulation and you can’t do that unless you have the confidence of the public. I can’t change your mind, but just watch us. The Herald-Traveler won’t play any part in our business, except as an independent paper,” said Graustein. Rep. Birmingham said former Attorney General Arthur K. Reading was motivated by political ambition when he pushed for the death penalty for the men found guilty of the car barn murder case, the Boston Herald reported (May 21, 1929, p. 29, via Geneaology Bank). John J. Devereaux, John J. McLaughlin, and Edward J. Heinlein were convicted in the murder of James H. Ferneau, a watchman on duty at the Boston and Middlesex Street Railway office in Waltham, during a 1925 robbery. According to Reading and the prosecutorial team, Devereaux killed Ferneau during a struggle in which the watchman was shot and beaten. At the time, McLaughlin and Heinlein were robbing the railway cashier on the second floor. The jury found that all three men were guilty of first degree murder and given the death penalty. Despite appeals by Birmingham and others for clemency, they were put to death by electrocution on Jan. 6, 1927, at the Massachusetts State Prison in Charlestown. In an impassioned speech, Birmingham accused Reading of furthering his own political career by advocating for the death penalty. Subsequently, Reading was forced to resign as attorney general because impeachment proceedings were under way. Birmingham was addressing a May 20, 1929, meeting of the City Club of the Massachusetts Council for the Abolition of the Death Penalty. Rev. Raymond L. Calkins presided at the meeting, which included other speakers who favored abolishing capital punishment.